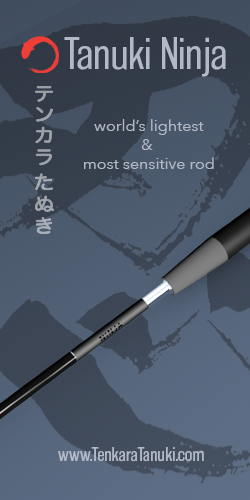 When I first heard Tenkara USA was redesigning their Ayu rod, it was a little disconcerting. I’ve seen it too many times before: a company has an excellent product—one that everybody likes. Then, they redesign it and it becomes pedestrian. I’m not sure what leads gear companies to do this but after a few casts, I was relieved to find that it wasn’t the case for the redesign of the Ayu. I’ve always like the original Ayu for several reasons—I like the grip and the softer action, but I also liked the 13 ft. length. To me, 13 ft. is the perfect all around length for the rivers and streams I fish. In fact, if the Iwana came in a 13 ft. version, I would probably favor that over the Ayu simply because I consider the 6:4 action to also be the best all around. And with a new 6:4 action, the Ayu Series II comes about as close to a 13 ft. Iwana as you will get. The first thing I noticed during the unboxing ritual was that this latest incarnation looks completely different. Gone are the signature green bands that used to make the Ayu recognizable from 50 yards downstream. Instead, the handle section is a gorgeous, woven graphite with bands of dark gray and brown. It’s very unique looking and a departure from the look of all other Tenkara USA rods. The rest of the blank is an unsanded, unpainted glossy finish similar to the current Iwana. Overall, it’s a much more subdued and elegant look than the previous green-banded model. The handle looks to be identical to the previous version of the Ayu with a half-wells style contour. I’ve always liked this grip so I’m glad they decided to keep it. When collapsed, the Series II is significantly longer than last year’s model. I’m not sure why (perhaps it has something to do with how the segments work together to create the new action. For most anglers, this probably won’t matter, though some backpackers might lament the slightly less compact size. 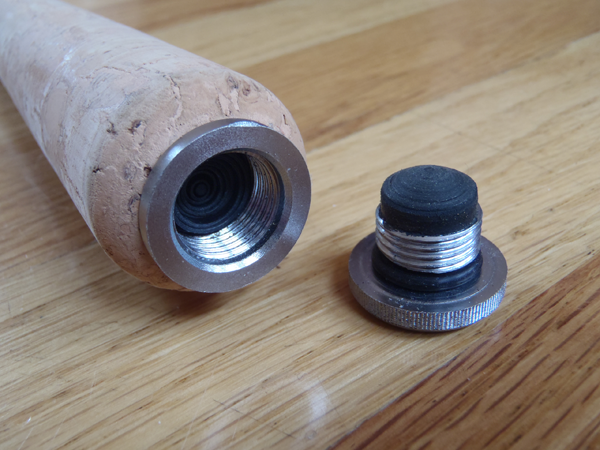 The rod plug is the typical wood and rubber plug, but with one addition—a red cord loop. 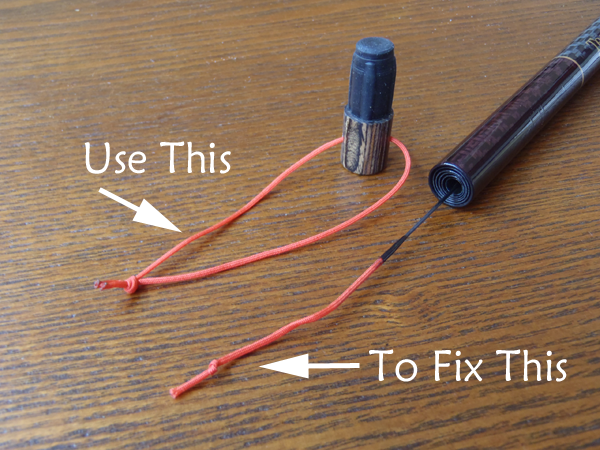 This idea was likely inspired by posts on Tenkara USA’s own forum where a member posted this DIY modification to make the notoriously easy-to-lose plugs more visible when dropped. But it also has two other benefits. One is that you can use the loop to secure the plug to a D-ring or other point of attachment to prevent loss. The other (and this is genius) is that the cord is actually made of lilian. This means anywhere you take your rod, you’ve got some backup lilian cord with you in case you break the tip or the lilian slips off and you need to make a field repair. Brilliant! And the end cap features a rubber bumper to silence the collapsed segments when closed. 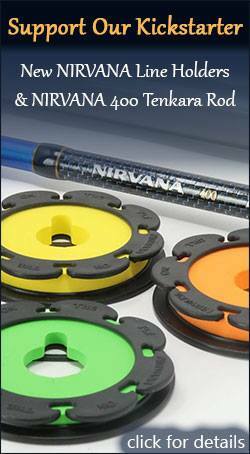 This seems to now be a standard feature on Tenkara USA rods now and I think is a good move. I find rod action difficult to describe with words since it’s so subjective. Two people can interpret the action of the same rod completely differently. Above, I likened the action of the Series II to a “13 ft.” Iwana and that’s about as close of description as I can give. It does bend into the 5:5 position, but it seems that the majority of loading takes place at 6:4. It’s noticeable more responsive than the previous Ayu with less tip bounce at the end of the cast and an overall much crisper action. The rod definitely has more backbone and allows you to bring fish to the tamo quicker. My one criticism of the rod is that at 3.6 oz. it is heavier than the previous model. The additional weight is probably another result of the action change. Casting the former and new Ayu side by side, the weight difference is noticeable. Don’t get me wrong, it’s not arm draining heavy—but it is noticeably heavier. If you’re used to casting the old Ayu, this is the first thing you will notice. But then again, the crisper action might compensate for any complaints about the extra weight. 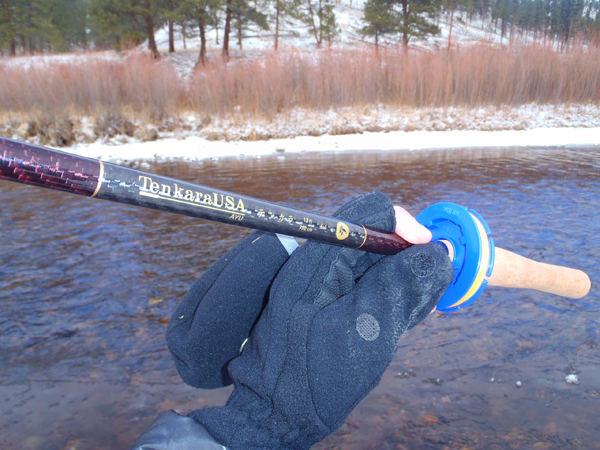 As with all Tenkara USA rods, the Ayu Series II comes with a fiberglass rod tube and rod bag. If you like the Iwana, but always wished it were a little longer, you’ll like the Ayu Series II. In my opinion, it’s a solid, all around tenkara rod with a few nice bells & whistles thrown in. 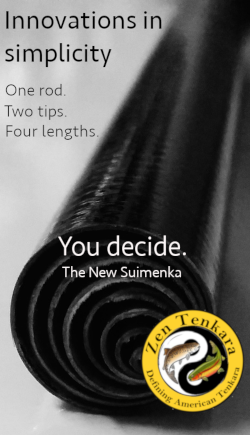 Clearly, Tenkara USA is listening to its customers and incorporating their feedback into their new designs. Now for the shocker: all these improvements come at the same price as last year’s model! The new Ayu Series II is now available here. 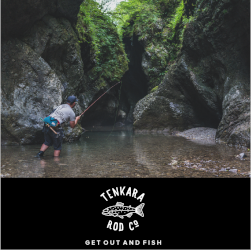 For a great writeup about the concepts behind the new design, visit the Tenkara USA Blog. Nice review, to me the weight would be a big turn off as after trying a few rods with most 3.8 meter rods being between 2.3 and 2.6 ozs that seems like a heavy rod. Love the look of it though. To be fair, it doesn’t feel too heavy in the hand. I’m just used to the old Ayu. I think someone who didn’t have prior experience with it wouldn’t even notice. Hi Jason: As usuall the presentation of the rod it is first class like all products of TUSA, but for me it is a rod to heavy for a 13 footer, I don`t know why Daniel can`t make all their rods ligther like Iwana. Today, with a little more experience, the weight it is one of the most important issue for me. I played with this rod quite a bit this past weekend and being a big fan of the Iwana I did favor its action. I know looks don’t really matter but it is a cool looking rod as well. I think the most impressive addition “to me” was the new lilian loop, genius! 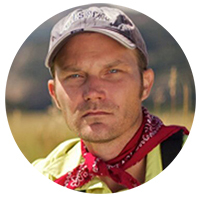 Jason Thanks for the video by Daniel. Where can one get some spare lilian for the “in the field repair”? I can see how that could save the day. Hi Luther. 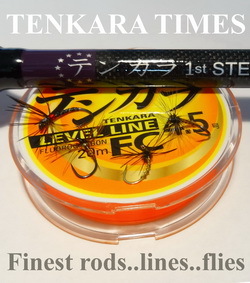 I believe you can get some from Chris at Tenkara Bum. I’d contact him. For me, I equate the new Ayu II someplace between an Ito and Iwana series. Since the Ito was a soft 6:4, for me the new Ayu does not feel as soft as the Ito but not as mid stiff as the Iwana, so right in between. So far I am really liking it! About the lillian availability, we do make it available directly through our site as well: http://www.tenkarausa.com/product_info.php/products_id/74 (second option on the dropdown menu). To be honest it’s not something I recommend getting as a “just in case”. The likelihood of losing that is probably higher than of needing it, especially if one is careful when tying the knot on or taking it off. And, we have added to the cap primarily to keep track of the plug. It’s basically an Ito that doesn’t have an extra 1’7″ zoom. .
Um nope. If you got that from my description, then I’ve failed. About the weight in the TUSA gear page they (Ayu and Ayu II) are assigned as having the same weight (102 grams). So now is a case to see if it’s really heavier or just feels heavier than the previous one! Jason, I got my Ayu II yesterday. Have not had an opportunity to cast it but wanted to say thanks for the detailed review. That’s great Thom. Let us know how you like it! After fishing the Ayu ll for and extended period , the additional weight is just too much to fish all day. I can euro nymph all day with no strain western style. The length is awesome, I’m thinking about using some tungsten putty to put a little weight in the handle. Any thoughts? Besides selling the rod. Actually, I don’t think the rod felt that heavy in the hand but counterweights might help. I’d be interested to hear if you experiment with them. Also, can I ask how you grip the rod? Depending on where you grip it might play into the perception of weight. I have moved my grip all over the rod, trying to find the right placement. I ordered some tungsten powder to see if a little extra weight will work. Other wise you will see some tenkara workout videos from me soon. Thanks Jason, fish on! I fished all day today with my Ayu II, and it performed fantastic. I also have an original Ayu, and while there is a noticeable weight difference in the hand side by side (I brought both with), I did not really notice in-use. Personally, I like the 13 ft. 6:4 rod. I wish it wasn’t discontinued, but happy I got mine while I could. The extra length while collapsed does not fit as well in my pack, where I usually carry it. It kinda “Pokes” into the side/top of the pack. We’ll see if it becomes an issue in the long term. Daniel did a good job of introducing an old mohetd of fishing to a new market. And, hopefully, he made some money for his efforts. But he is delusional if he thinks that he can keep the profits of this concept to himself forever. The world is full of companies and individuals who are ready to pounce on the latest trend. Most are mere imitators who will take a temporary share of the market. Although they are annoying, they will quickly disappear and anyone who has bought one of their products will be left without recourse if there is a warranty issue. But a few will bring the concept to a new level which might be good for Daniel if he is paying attention.The point is that we all need to keep moving forward. The moment that we decide to rest on our laurels is also the day we write our obituary.